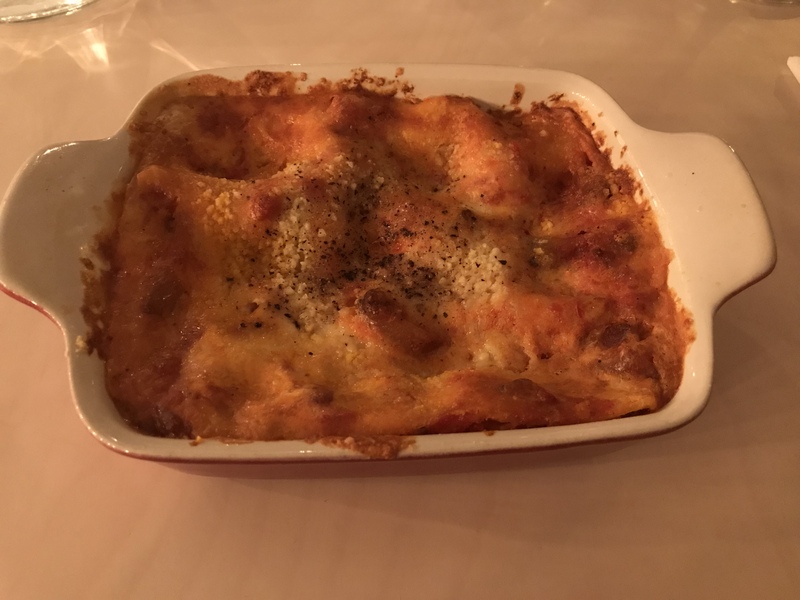 Lasagneria, as the name suggests, specialise in home-made Lasagne dishes – they also have a Cannelloni. 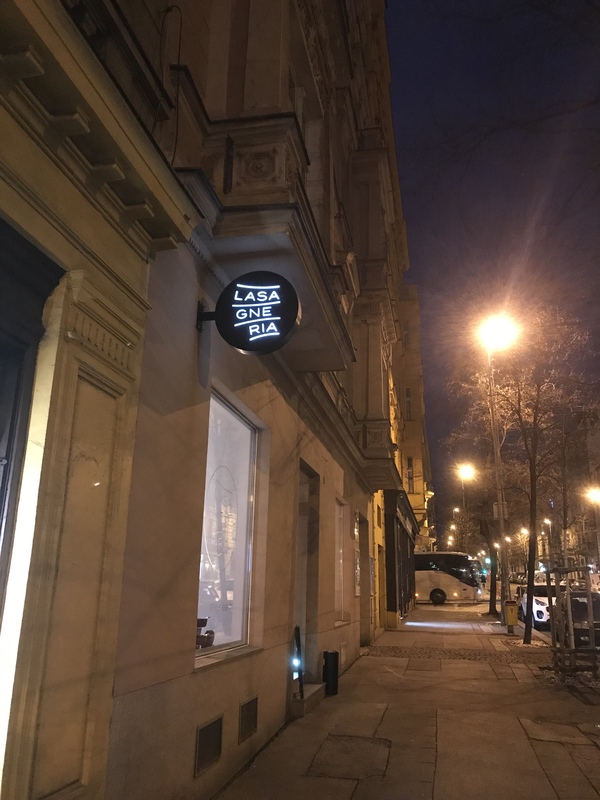 The clever name and logo is visible from the street. And the place looks inviting, especially on a cold dark Sunday (27th Jan) evening. 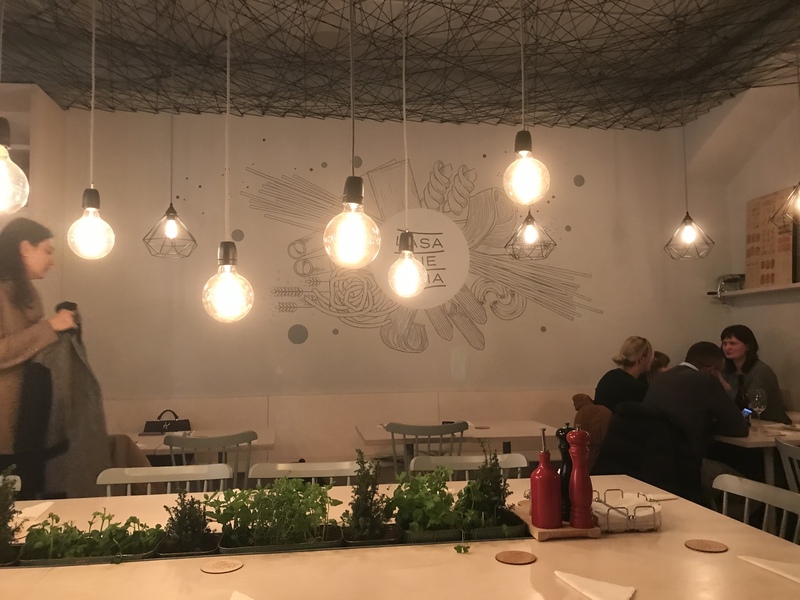 The interior is nicely decorated with an interesting string ceiling that could easily be a mathematical model of the Universe! We booked a table and found the reservation with our name on it. 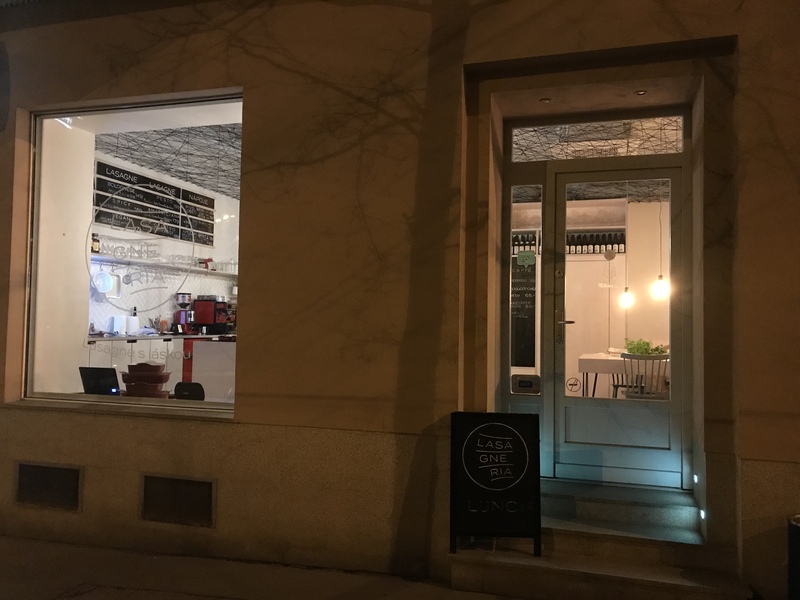 As this was our first visit, we weren’t sure whether someone would take our order while seated or if we had to visit the counter. It soon became apparent that we should visit the counter. 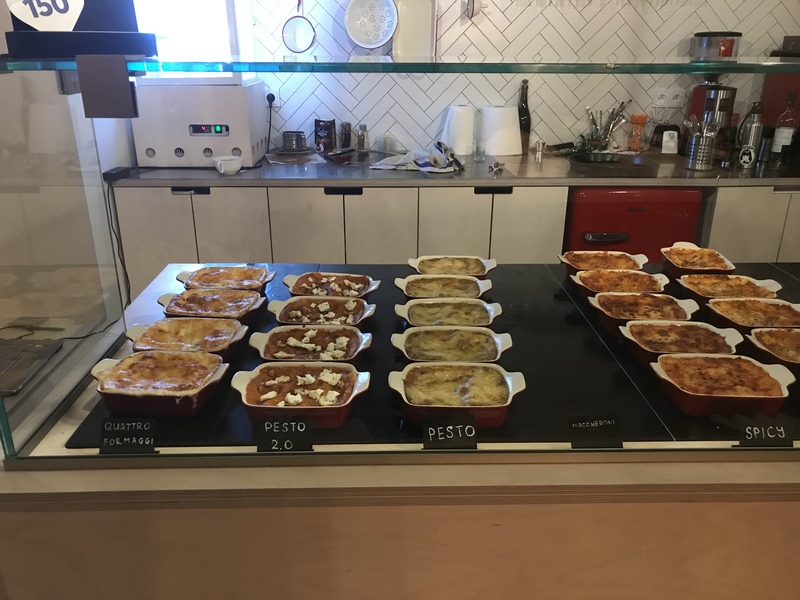 The counter had a display of various lasagne dishes – plus one cannelloni (salmon). I’m assuming they are all part-baked and then just heated on order. We choose one ‘Lasagna Classica alla Bolognese’ (149Kč) and one ‘Lasagne Amatriciana’ (179Kč). We also asked for two glasses of Southern Italy Aglianico red (90 per 0.2dl glass) and a carafe of tap water. The tap water was free which is always a positive for me. We didn’t have to pay while ordering. Everything was delivered to our table. The Aglianico red wine was good. Both lasagne dishes looked the same when they arrived. The classic lasagne was piping hot, the Amatriciana just heated through. I couldn’t understand why my partner was unable to start eating until we compared temperatures. Both dishes were good, although the classic lasagne was favourite. I’m slightly disappointed that the dishes weren’t equally heated. I should confess that I have a slight obsession with getting lasagne just right. What I hate is where to much béchamel is used between the lasagna sheets and the whole thing is a sloppy mess. I also like a tall lasagne, with plenty of lasagna sheets, sturdy enough that it can be cut like a cake. To this end, I’ve had some success with using ricotta instead of béchamel – not sure if this offends purists. So how does Lasagneria compare to my perfect lasagne? Well I’d need to tip the whole dish onto a plate to check, but it certainly wasn’t sloppy. The taste was good, although I can’t pretend that I could tell that fresh lasagna sheets were used rather than dry. I’d also like it to be a little taller with extra sheets. The bathroom which was modern and clean. Sadly all hand towels had been used from both dispensers and I raised this with the lady on the counter – hopefully just a one-off. I visited the counter to pay and realised that they also offer tiramisu and panna cotta. We’d also had just one glass of wine, but might have had another if offered. So I think that Lasagneria are losing revenue by not having a waitress service. However, the Nandos chicken chain operate a similar model and they seem to do okay. 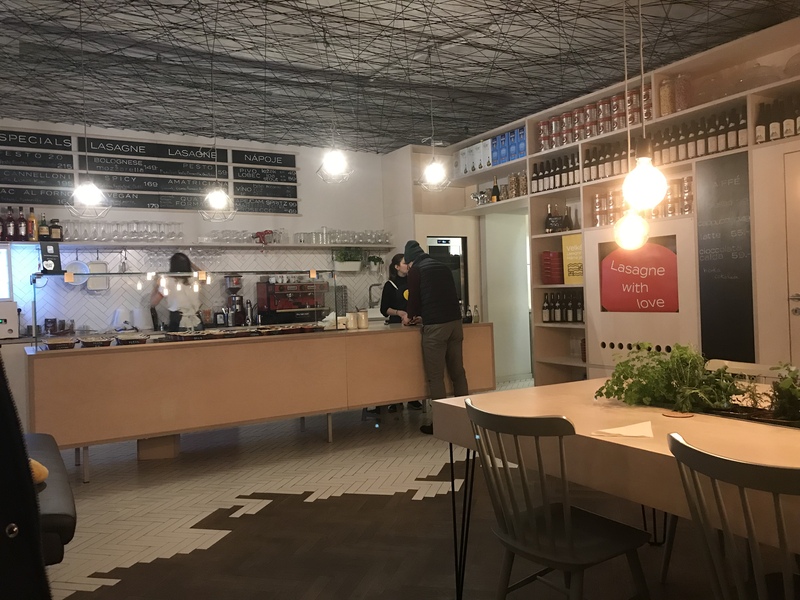 They also offer take-away food – thanks to Jennifer who commented on this article and advised: “The takeaway food comes in the same ceramic dishes they have in the restaurant – very high quality. You pay a deposit of 500Kč for the large (family-sized) lasagna pan….It’s completely cooked – you just warm it up.”. Despite the few minor issues, we enjoyed our visit and would certainly return. In Italian, lasagna are the individual flat rectangular sheets of pasta. So the plural, lots of sheets making a dish, is lasagne. What I struggled with when writing this review was how to refer to more than one lasagne dish. Lasagnes didn’t sound right and so I went for lasagne dishes.